$264.99 This item is selling for $264.99 on eBay. 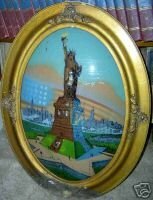 Antique Reverse Painted Concave Glass "Statue of Liberty" Painting Statue of Liberty Reverse Painting, WW I Signed Eglomise It measures 19"x 25" Large vintage reverse painted bubble glass painting of the Statue of Liberty with a large American Flag in the background. It also has a nicely detailed view of New York City. The painting also has foiled accents. It is an antique gilted wood frame with carved floral accents. It is an eye catcher. Signed: copyright 1917 (the artists name may be Ernest xxxxxxx) Chicago Statue of Liberty N.Y. Dating from World War I, 1910 to 1920. Now or then what better way to show your pride than to have this reverse painting on glass of the Statue of Liberty hanging in your parlor. The oval frame measures 19" inches wide by 25" inches tall. The actual dimensions of the glass reverse painting are about 13 1/4 " inches by 19 1/4 " inches with the frame itself being about 3" inches wide. The frame is wood with four decorative floral scroll elements applied around the edges of the frame. These decorative elements are made from plaster of Paris or some type of composition material. The piece of glass that the reverse painting is done on is convex and was made to fit this frame. The painting certainly captures the patriotic theme and pride intended by the painter. The piece has been knocked around over the years. There are some surface rubs, chips out of the gold finish on the frame, revealing wood and gesso underneath. The painting has some areas where the paint has started to flake off or discolor, the bottom outside frame has the most see photo where the finish is rubbed down to the wood frame itself. Still, the frame is solid and it is ready to hang on a wall. Closely inspect the photograph and you will get a good sense of the piece with all its simple elegance and flaws. There are some paint flakes note: the torch, the torch fire, center of lady libertys gown, a few spots in the sky area, a few spots on the statue base the foiled background has come loose and could be reapplied if you like. some of the white reflections on the glass appeared from the flash while taking the photos.